I love the anthropologie store! 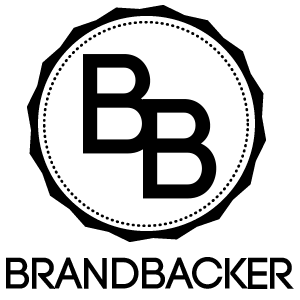 The store is full of unique and wonderful clothing, shoes, accessorizes, and home decor. So it is no wonder that my latest sewing project would be inspired from two shirts I found online at their website. 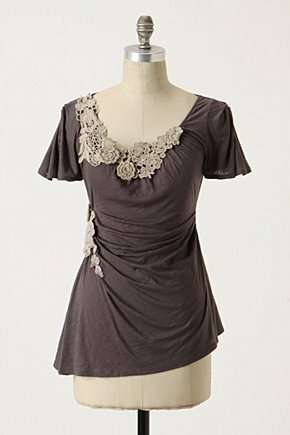 My shirt has the lace applique on the side (inspired by the Perennial Plot Shirt) and a dramatic hem line (inspired by the Providence Top). Bodice of t-shirt - Draped on Lizzy my dressform. Lace Applique - I tea dyed some leftover lace from the curtains in our house, that Gabrielle and my mom made seven, or eight years ago. Then I cut out each rose and arranged them into a oval onto my shirt. Satin stitched the whole down and then you are done. Easy as pie once you figure it out. =) You know what I discovered? I love tea dying! =) In fact, I want to find out more about natural dyes. 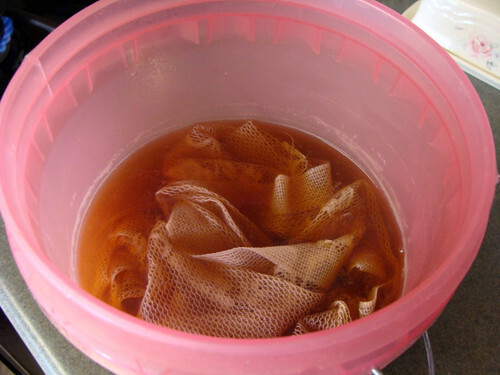 Do any of you do dye fabrics using natural resources? Fabric Used - Brown knit bought in LA. I still have some knit leftover and I'm thinking on making either a shirt to sell on etsy, or a flow-y cardigan for myself. Then again, I could make a shirt for Gabrielle. 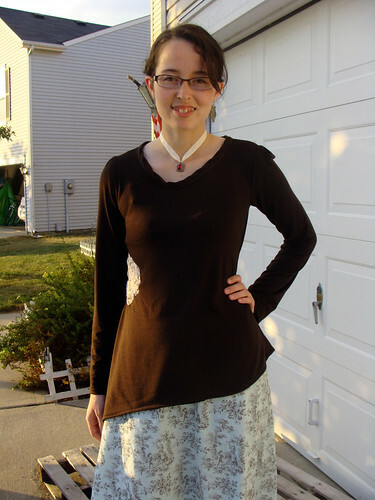 Bonus to Making Your Own Skirts - You can fit the shirt to your own body shape. Your long sleeves can be long sleeves on long arms - like mine. =) If you are long-waisted, or short-waisted you can make adjustments for that. No one else will have the same shirt - as you made it yourself. I REALLY love this outfit,Ashley! I love Anthropologie too, but find that they are quite expensive, so perhaps I will have to try my 'quilters' hands at sewing a shirt and skirt for myself one day after all. 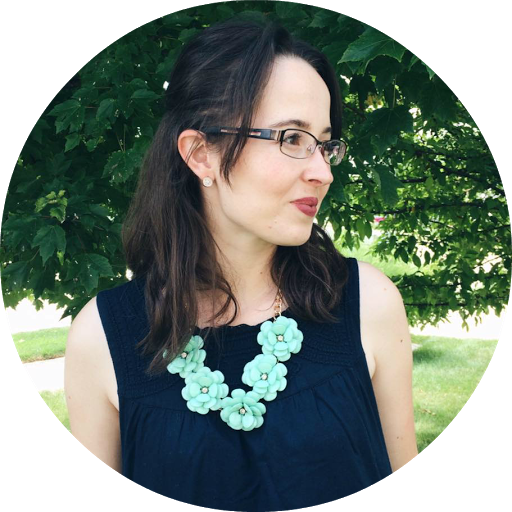 I love following your blog, and I am always very excited to see what sewing project you've been up to lately! So, how does one tea-dye, exactly? are there any solutions to put the lace into prior the tea? What tea works the best? Very pretty! Your pictures are great! LOVE LOVE LOVE it!!!! The applique on one side has a very figure-flattering effect... with a light applique on a dark shirt, voila! 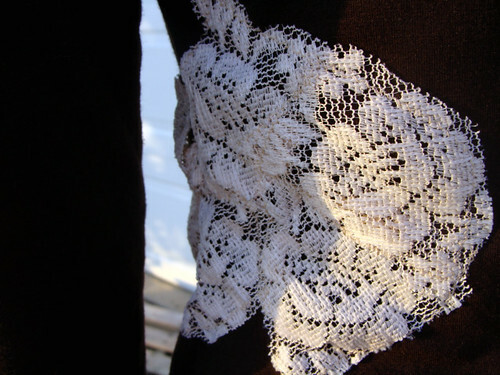 I love lace and brown together, too! :) I wanna make one too.....what pattern did you use? And did you bind your neckline? 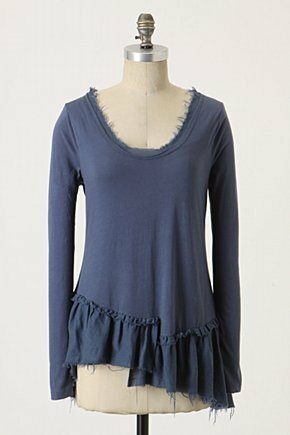 Pointed drape sleeves would look lovely with that hemline, too! Bethany - LOL! =P That is one of my favorite parts in Cranford. Celine - Thanks for the link. I just put four chia tea bags into a small bucket with boiling hot water. I don't think there is any special tea to use. I always use what ever tea we have on hand, or teas we didn't like.